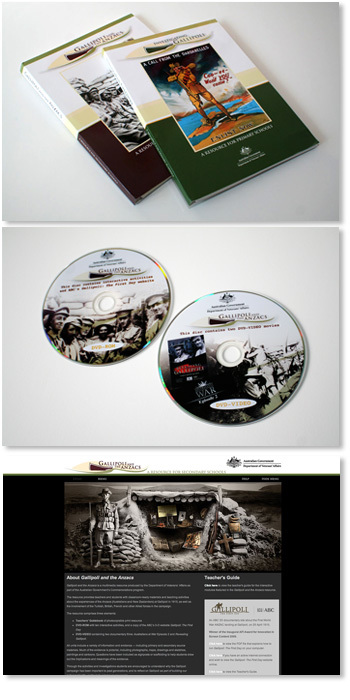 These two resource kits have been produced by Ryebuck Media for the Department of Veterans' Affairs as part of the Australian Government's Commemorations program. A copy of the respective kits has been sent to each secondary school and each primary school in Australia. Gallipoli and the Anzacs is a classroom inquiry resource that enables students to understand and explore ANZAC Day – a significant event in Australia’s national history and identity. The self-contained classroom-ready materials enable them to learn about the experiences of the Anzacs at Gallipoli, the main features of the campaign and the reasons why Gallipoli has been and continues to be an event of national significance for Australians. Australians at War Episode 2 (2002) with an Australian focus to the campaign. Investigating Gallipoli is the primary school version of the above that has been modified for use with students in years 4-6. The Teachers’ Guidebook contains a set of Storybook pages and evidence sheets so that students can write their own account of the Gallipoli experience. The DVD-ROM is the same as that included in secondary kit as outlined above. The DVD-VIDEO contains just one documentary film – Australians at War Episode 2 (2002). Curriculum connections and outcomes are clearly outlined in both of the education kits and an inquiry methodology underpins the resources to ensure that students come to their own fair and balanced conclusions about the appropriateness and relevance of Gallipoli as part of our national identity.